Location: The Maritza hotel is situated in the town center of Plovdiv, on the bank of Maritza River. Its proximity to the International Fair ground, to the Old town and the City Shopping Center makes it very good choice for business or leisure visits to Plovdiv. Accommodation: The hotel offers two VIP floors, presidential apartment, 47 single rooms, 87 double rooms and 19 luxury apartments. All apartments on the VIP floor are equipped with two bathrooms with bath-tub, mini-bar, TV. Four of the floors, which are entirely renovated, are equipped with telephone, mini-bar, TV and WC/shower. Food: Main restaurant with 170 seats, cocktail-bar "Hawaii" with 150 seats, located on the very bank of Maritza River, Garden restaurant and Lobby-bar. Sport and facilities: Fitness center, sauna, Jacuzzi, massage, acupressure, kinesitherapy and body-building. 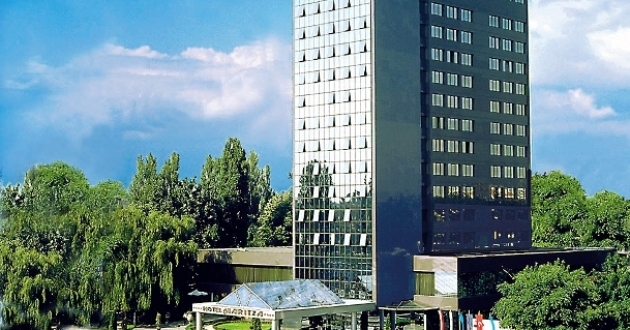 Meeting and conference facilities: The hotel offers 2 multifunctional conference halls - "Plovdiv" with 80 to 100 seats and "Hebar" with 30 seats. The halls are equipped with three language simultaneous translation for 30 participants, large screen, overhead projector, TV and video. The hotel's business center offers copy and fax services, Internet connection, etc.